He has been called the fastest man on no legs. 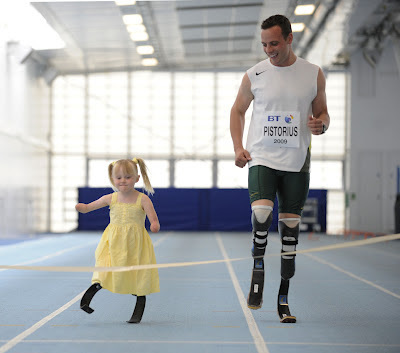 But Oscar 'Blade Runner' Pistorius got a run for his money when five-year-old Ellie Challis challenged him to a race on their bionic feet. 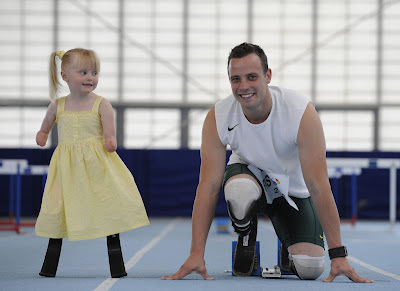 Paralympian Pistorius, world record holder for double amputees at 100, 200 and 400 metres, may have made some allowance for age and the fact that Ellie's blades were fitted only last month. But she had clearly learned quicker than he bargained for Ellie crossed the line first in all four of their 15-metre races. The youngster, from Little Clacton, Essex, lost her hands and lower legs after contracting meningitis at 16 months. Ellie races with Oscar Pistorious in this May 17, photo. Now, this made my year!!! Just as you start to lose faith in mankind in general, this guy shows up and stores it for the simple fact that he is so HUMAN, and with so much good will and spirit. That really is enough to bring a tear to ones eye!! What an amazing Guy!